Background: Mounting evidence over the past decade suggests that the number of phytochemicals were identified and designed on the basis of computer modeling (In slico method) to understand the interactions among the anti-cancer targeting proteins. Objectives: The aim of the present research was to find the anti-cancer targeting efficiency of phloretin by molecular docking. Methods: Based on the experimental evidence, a phytochemical of phloretin and epidermal growth factor receptor (EGFR), B cell lymphoma 2 (Bcl-2), nuclear factor-κB (NFkB), c-Kit receptor protein-tyrosine kinase, Farnesyl transferase, platelet-derived growth factors (PDGFs) and vascular endothelial growth factor receptor 2 (VEGFR2) proteins were utilized to perform induced fit docking by using Glide 6.5 (Schrodinger 2014-2). Multiple numbers of the poses were generated and evaluated for understanding the binding conformations and common interacting residues between ligands and proteins. Results: The docking results revealed that phloretin exhibited significant binding interaction pattern when compare to the known cancer target native inhibitor. Conclusion: Phloretin revealed good docking score and glide energy. Further studies are needed to explore its pharmacophoere properties and inhibitory potential in experimental models. 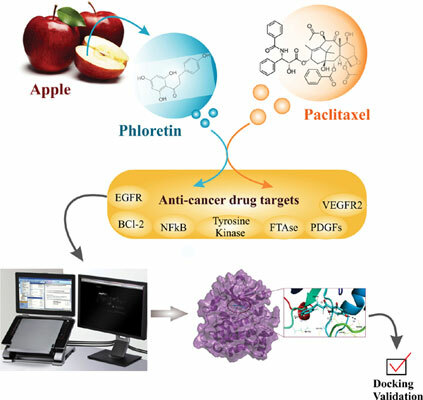 Anticancer, phytochemical, phloretin, molecular docking, in silico drug discovery.